Try this easy soup for a twist on classic chicken noodle that the entire family will love. The typical egg noodles are replaced by fresh cheese tortellini, and simmered in a flavorful chicken broth filled with herbs like oregano, thyme and bay leaves. Sautéeing the aromatics and the chicken in the same pot makes for easy clean-up. Quick-cooking zucchini provides texture and added nutrition. You'll love how the tortellini's cheesy filling mingles with the savory broth as you bite into it! Plus, the soup is ready in 30 minutes, making it a great recipe for busy weeknights. Switch up the vegetables depending on the season. During the fall and winter, swap the zucchini for cubed winter squash or sweet potatoes (they'll need a bit more cooking time, so add them to the pot at the same time as the carrots). In spring, try fresh peas or asparagus cut into 1-inch pieces. Per Serving: 588 calories; 19g fat; 49.1g carbohydrates; 53g protein; 131mg cholesterol; 862mg sodium. This recipe is glorious. I cooked this mostly from my pantry with just a little fresh, really easy weeknight dish. Even my 3 year old was asking for seconds. 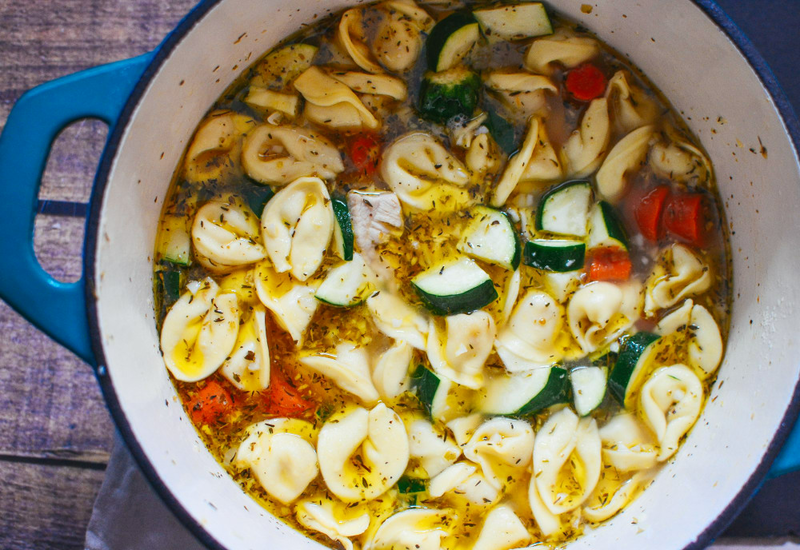 My kids loved this chicken tortellini soup. I've never had tortellini before, but I definitely love it and plan to make it again. I also loved that it uses zucchini, it's a great way to introduce this vegetable to the kids. Mine didn't even flinch at it, they loved it. Tried this delicious chicken tortellini soup, it was so good! Instead of using zucchini, I swapped in celery. Other than that, I loved everything about this recipe, so perfect and delicious. Because it's spring I made this recipe using both fresh peas and asparagus. I used low sodium chicken broth as well. This was a really good recipe. This is a great alternative to chicken noodle soup. Winter squash and sweet potatoes worked perfectly. The tortellini are my favorite, it's a nice and hearty soup.